Brooke Astor was known as a grand dame of the New York social scene, and had neither a handbag collection nor reality television show. 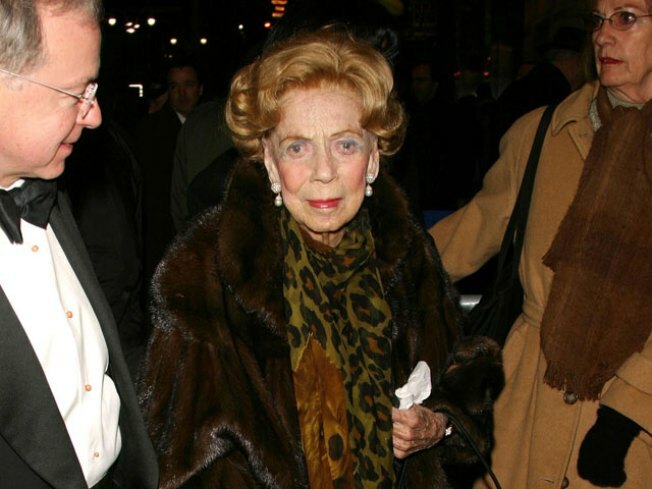 As if the saga of Brooke Astor couldn't get any more creepy, weird and sad, along comes a new book titled "Mrs. Astor Regrets", apparently after her Vanity Fare column. Prominently featured in the tome are accounts aides wrote down while listening to a baby monitor installed in Mrs. Astor's room when she insisted she be left alone by attendants, which Christopher Mason refers to as "The Baby Monitor Diaries" in a story on The Daily Beast today. Astor, who died in 2007 at age 104, enjoyed a reputation as a genial and gracious philanthropist, and old guard New York Society relic. When allegations of mistreatment and abuse—famously ranging from coercion to the centenarian being forced to sleep in a torn and stained nightgown on a bed that had been micturated upon—surfaced in 2006, famous friends showed concern and the whole mess provided tabloid fodder for a few years until New York Social Diarist DavidPatrick Columbia's obituary in Quest could finally wrest her name from the pages of Page Six. Or maybe not quite. The son who is accused of the misconduct, Anthony Marshall, now 84, will stand trial in New York in January; and if the book is any indication, things do not look good for the Astor scion.